I have plans to visit the Lammas Fair in Ballycastle, Co Antrim for the first time in over 20 years. The last time I was there I was working alongside my grandmother, great aunt and sister selling dulse and the infamous Devlins’ Yellowman that is synonymous with the festival. The purpose of my 2015 visit is to record footage for a radio documentary I am working on and Yellowman is at the heart of the story. My Dad is coming with me to take part in some interviews and provide some insights into how the Lammas Fair has changed. However, it is unlikely we will find genuine Yellowman for sale, made with the secret Devlins’ recipe, the details of which were bequeathed to me by my grandmother and great aunt many years ago. The road trip is bound to conjure up some great memories and I’m sure there will be a rendition or two of this Ruby Murray number A lasting memory from years ago is the swarms of wasps that appeared when the Yellowman was being laid out. Devlins’ Yellowman arrived at the Lammas Fair in blocks created by snaking the product when packing it after it left the “production line”. I love these pics of my father breaking a block of Yellowman in 1967 which I found in the Belfast Telegraph photo archives. As you can see he had to use a hammer and in today’s safety stringent climate, I imagine he would not only have to wear plastic gloves but also safety goggles to protect his eyes! 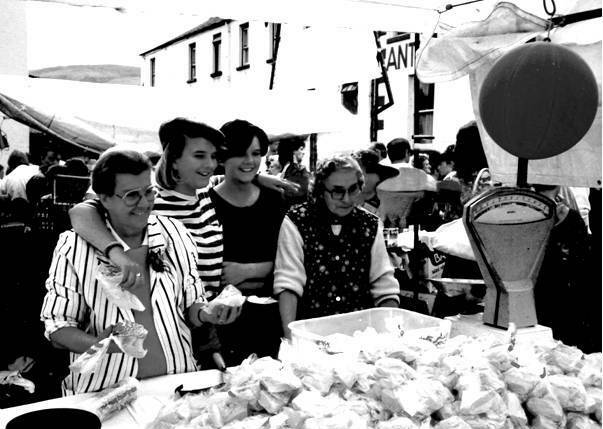 With my grandmother, sister and great aunt at the Lammas Fair. Thinking of family at Christmas reminded me of the Lammas Fair. I stumbled across your article, just wanted to let you know I sold the last bag of genuine Yellowman at the Lammas fair 4years ago. I worked the stalls that you are pictured in for nearly 25 years. My grandfathers were Willie Agnew and Archie Devlin. So happy to read about you keeping the old days alive. Take care and have a wonderful Christmas with your family. Paul Agnew – Too late, too late, it’s past you bye. Thanks for your comment Paul. I hope you had a lovely Christmas. I’m currently making a radio documentary about Devlins’ Yellowman. My grandmother and great aunt, who were sisters of your grandfather Archie, passed the secret recipe on to me. I hope you will have a listen when it airs in the summer.